Last summer a high school classmate of mine, Kath Usitalo, visited the museum and asked to interview me. Since there was other media coverage of the museum last year, she waited to post her article this year. It is posted on the website: http://greatlakesgazette.wordpress.com for June 16th. I have reproduced the article below. Thanks, Kath, for a job well done! 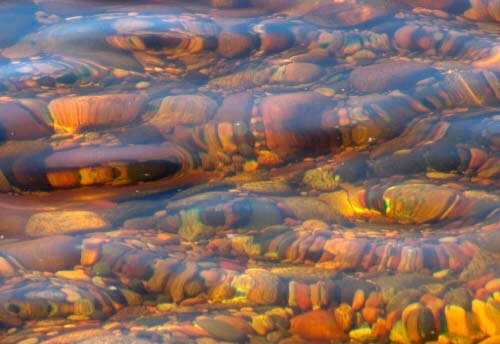 Plenty of beautiful rocks along the Lake Superior shore near Grand Marais, but you may need the help of The Agate Lady to find the elusive semi-precious gemstone. Somehow, though, I learned that she’d moved from the Detroit area to Grand Marais, a UP fishing village on Lake Superior that is like a picturesque fishing village in Maine, without the lobster. It’s also the eastern entrance to Pictured Rocks National Lakeshore, and when we swung through there last summer we met up with Karen at her museum. Yes, she owns a museum. How many people at your high school reunion can make that claim? 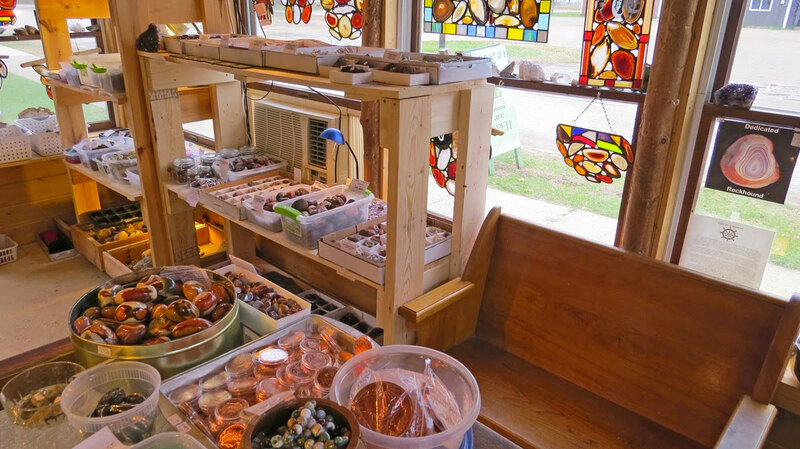 Karen Brzys shares her knowledge and love of agates through her classes and museum. Through a series of events that can only be explained as destiny, Karen left the stress and travel of a dozen jobs, moved to Grand Marais, and became guardian of Axel’s repository of local lore, artifacts, and mineral collection. In 1999 she reopened the Gitche Gumee Agate and History Museum. 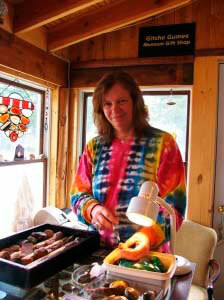 She is also a noted expert on agates, and is known as The Agate Lady. 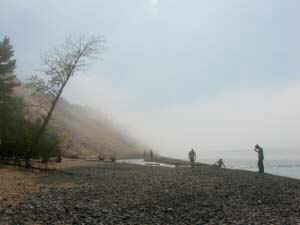 Rockhounders in a fog about which are agates, near Grand Marais. What lobsters are to Maine, agates are to Grand Marais. No, you can’t eat the billion-year-old, semi-precious gemstones, but people come from all over to hunt for agates on the Lake Superior shore. Karen assists by offering classes that help rockhounders to identify agates and differentiate between beach rocks. You can even arrange to have her accompany you to a local beach for a lesson and hunting expedition. Make time to visit Grand Marais. 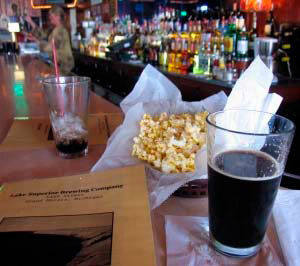 Sample the local brew at Lake Superior Brewing Company, and take in the Gitche Gumee Agate and History Museum. Browse the exhibits and take a class on agates (you may get to see the very special WOWSER rocks). Pick up a copy of Karen’s book (did I mention she’s an author?). Buy her handcrafted mineral art (did I mention she’s an artist?). Told you, this Agate Lady rocks. 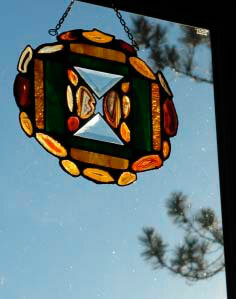 Karen combines rocks and stained glass to create mineral art, like this piece we enjoy at Blue Skies. 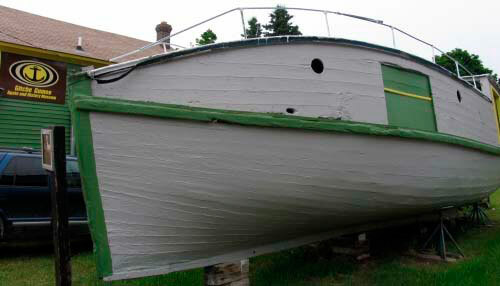 Fishing boat hand built by Axel Niemi, who founded the Gitche Gumee Museum and mentored Karen.